Editor's note: Strong Biblical, historical, and scientific evidence is presented in this article to support the authenticity and legitimacy of Black Hebrews and Jews. 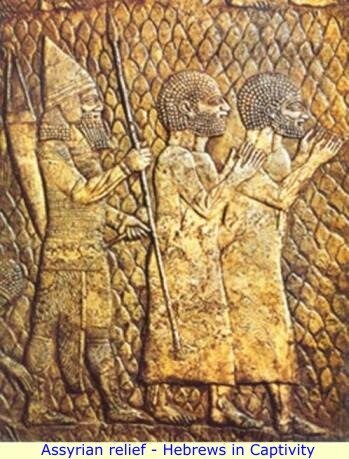 It has also been speculated that the Jewish presence and influence was greatly helped by the ancient gold trade between Persia and Africa. Jews were the main intermediaries of this trade in the medieval ages since most Muslims (due toÂ Islamic laws prohibition on usury) were wary of its usurious dimensions. These Jewish itinerant traders came to rely on contacts with the various Jewish communities of West African who proved no mean help in sourcing the scarce commodity. Thus, for instance, the silk of the Royal Kente cloths of the Ashanti reputedly came from China. Various historical accounts claim that Jewish travelers from Persia had organized exchanges of Chinese silk for gold in the Kingdom of Ghana; the Ashanti needed the silk for weaving Kente cloth and the Jews need gold for their intrinsic and fiscal value. It is said that the Ashanti words for numbers relate to those in Parsi, the language of Persia. See Lichtblau. The E3b haplogroup has been observed in all Jewish groups world wide. It is considered to be the 2nd most prevelent haplogroup amoung the Jewish population. It is found in moderate amounts in all Jewish populations, from Ashkenazi, Sephardic, Kurdish, Yemen, Samaritan and even among Djerba Jewish groups. The scientific consensus is that Haplogroup E3b (M35) appears to have originated in East Africa, but has been carried from there to the Near East and then on to North Africa and Europe. Today it is most common in East Africa, North Africa, the Near East and around the Mediterranean. Haplogroup J (previously known as HG9 or Eu9/Eu10) is a Y-chromosome DNA haplogroup. t is subdivided into two subclades: haplogroup J2, defined by the M172 marker, and haplogroup J1, defined by the M267 marker. Of special interest are maps that show the geographical spread of the J haplogroup. J1 and J2 are both common in southern Europe, central Europe, the Mediterranean region, and Africa. The J haplogroup is considered to be a signature gene of Jewish ancestry and the cohen modal gene happens to be a subgroup of J. In fact, the highest frequencies of J1 (M267) are seen in the Middle East, north Africa, and Ethiopia. See (Thomas et al. 1999). J2 (M172) also exists in significant proportions across Africa especially among the semitic speaking peoples of Tigriniya, Amhara, and Oromiya. The presence among the Lemba of a disproportionate number of men carrying a particular polymorphism on the Y chromosome known as the Cohen modal haplotype suggests an ancestral link to the Jewish population. One sub-clan within the Lemba, the Buba clan, is considered by the Lemba to be their priestly clan. Among a small sample of the Buba, fifty-two percent of males were found to carry the Cohen modal haplotype CMH, which is generally suggestive of Y-DNA haplogroup J, but notably prevalent among Jewish Kohanim, or priests. Many reasons have been sought for the decline and virtual disappearance of Africa’s once thriviing Jewish communities of black Jews. Many see the beginning of this decline as contemporaneous with the advent of the Islamic religion in Africa. Some historical accounts highlight the fact that black Jews were die-hard nationalistic traditionalists and had led the black African resistance against the influx of the black muslim jihadists and their new interpretation of morality. The most notableof these black Jewish nationalists was Queen Kahina Dahiya Bint Thabitah ibn Tifan otherwise known as El-Kahina. A descendant of one of the priestly Black Jewish families of North Africa, Kahina led the nationalist resistance against the muslim invasion until her defeat at the hands of Hassan Ibn Numan. See Margolis, “History of Jewish people”, 1927 pages 278-279. See also Remy Ilona, “The Igbos : Jews in Africa?” volume 1, Research Findings Historical Links, Commentaries, Narratives,” 2004, Mega Press Limited, Abuja, Nigeria. Amidst this tumult, the Jews of Northern and West Africa were given a choice of conversion or emigration. Many left for the deeper forest recesses of West Africa seeking the peace and tranquility that appeared to elude them in each generation. The late incursions by the colonialist christian elements of Europe did not make matters any better. There seems to have been a direct link between the incursion of relatively modern religions in Africa and the decline of the ancient practise of the Hebrews which had a pride of place in Africa, its mother land. For instance the Jewish enclaves of Qamnurya or Naghira in the area of modern Senegal was destroyed completely in the wake of sectarian unrest. Similarly, Al-Maghili a prominent black Muslim noble not only destroyed the Jewish enclaves of Tuat in the old Mali empire, he convinced other potentates throughout the Western Sudan to banish Jews from the empire’s cities. See Remy Ilona, supra.